Today we’re talking with Kimberly Hall, a Licensed Massage Therapist at the Hidden Springs Wellness Center. 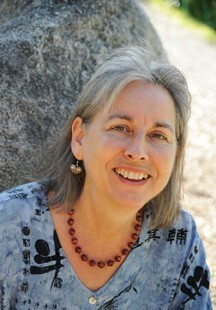 Kimberly focuses decades of experience through a combination of powerful healing modalities to deliver a completely unique form of holistic revitalization. What first drew you to healing work? When I was 23 I took a big leap and moved from Indiana – where I had just finished my BA in Psychology – to Portland, Oregon. I had some old injuries and went for a Polarity Therapy session. The affects were amazing. With each session I felt more grounded, connected and … light! I began to understand the deep connection between body, mind and spirit. The more I experienced the work, the more passionate I became to learn it and to become a practitioner myself. And that’s exactly what I did, through studying at the Polarity Institute on Orcas Island, WA. After graduation, I joined the Polarity Institute staff. I lived and worked with them for the next 8 years doing Polarity Therapy and massage. Those years were rich with the beauty and complexity of living closely with a group of people totally dedicated to health and healing. We opened other centers in Calistoga, CA and Murrieta Hot Springs, CA, which was where I met my husband Steven. We’ve been together for 26 years now. Our marriage is like a beautiful hand woven rug. We had heard lots of good things about Ashland and when we left the community we decided that this might be the place for us. We arrived in 1990, just in time for the Halloween parade. In fact, that was my first impression of this town! It seems appropriate now because life here has continued to be one adventure after another. I studied at the Ashland Institute of Massage, received my Oregon massage license, and started my massage practice in 1998. Then in 2000 I joined the staff at the Hidden Springs Wellness Center. This is such a beautiful, supportive and healing space to work in. It’s fun to be with a great group of practitioners and I know we all help each other take our work with clients to the next level of effectiveness. I’m very grateful to be part of this! What modalities do you use in your work? Polarity Therapy is a primary technique that I use. Dr. Randolf Stone, the man who developed it, taught that the uninterrupted flow of life force in the body was the number one, most vital principle of health. The goal of Polarity Therapy is to stimulate and balance the energy of the body through physical touch, exercise, nutrition and mental/emotional counseling. Clients report significant results when our sessions help restore this flow. Besides Polarity Therapy, I use Swedish Massage, Trager, Craniosacral, Chi Nei Tsang and Deep Tissue. I’ve also gathered many other bits and pieces in weekend workshops such as Energy Medicine with Donna Eden, Ayurvedic Marma Points with Dr. Gupta, Headaches Relief offered through RCC and more information and techniques from local massage practitioners in various study groups. What else are you involved in at Hidden Springs? I assist in our Seasonal Detox Center, which is really a one-of-a-kind facility here in the Valley. We offer Detox classes and many of our clients use Steam Baths, Peat Baths, Salt Scrubs and Lymphatic Massage, our Far Infra-red Sauna and cold plunge. These services are particularly good for boosting the immune system and cleaning out toxins. Now is the time to do this, as we approach the winter season and upcoming holidays. It’s about lightening the load to optimize our health, truly preventative health care! Camping, music and youth. Oregon is a camping paradise and I love sleeping under the stars. There are so many beautiful places… fresh lakes, sparkling streams, tall mountains and old trees. I rediscovered Squaw Lake recently. We take along our bikes and inflatable boats, even a portable sweat lodge! I also like to sing and am part of the Rogue World Ensemble. Love those complex harmonies! I’ve always enjoyed percussion and have played in a conga drumming group as well as a marimba group. Fantastic rhythms in both. I’ve just started to take Taiko lessons and we’ll see where that leads. I like to volunteer with the VAYA program at Mediation Works that helps teen offenders realize the impact of their criminal actions and make better choices in the future. What’s the next step in your healing career? As a body worker, I experience the amazing capacity of our bodies to heal, if only given the chance. Unfortunately, we live in an increasingly toxic world. I’m studying now with the International Institute for Building Biology and Ecology and learning how to measure and minimize the toxins that permeate our homes and workplaces. It’s a real wake up call to discover just what’s in our air, water, the chemical building materials, and how electromagnetic radiation in our homes and offices affects our health and sleep. Minimizing these environmental toxins revives our life force, enabling us to shift from survival mode into vibrancy, to build and maintain truly healthy bodies, with consistent peace of mind and lightness of spirit. I’m very excited about the incredible health implications of this new work and how it can support my clients to get long lasting results from the work we do together. Kimberly’s November/December Massage Special: Buy one, receive another for a 50% discount. Check out her ad in this edition for details. To schedule, call the Hidden Springs Wellness Center at 541-488-8858. For more information on the Healthy Home Inspection program, call Hidden Springs and leave a message for James Haim.